This infamous “God is dead” speech by Nietzsche underscores the implications of a world without God. Nothing awaits but darkness. Nietzsche was carrying out liberalism to its logical conclusion. A tamed god is ultimately a god of our own making. A god of our own making is really no god at all. When Nietzsche declared, “God is dead,” he was speaking of the god of liberalism. And, sadly, the god of liberalism had eclipsed the God of the Bible in the German Lutheran Church of Nietzsche’s day. The idol had obscured the real thing. Nietzsche declared what his contemporaries were too disingenuous to say themselves. What did Nietzsche find at the end of the logical conclusion? Nothingness. His philosophy is known as nihilism, the philosophy of nothingness. Paul encountered a similar thread of thinking. In Acts 17, as he gives his speech at Athens, he declares that Jesus has been raised from the dead. Luke records that, when some in the crowd heard this, they mocked him (Acts 17:32). These were the Epicureans in the crowd. They were skeptical of all this talk of an afterlife. What awaited after death according to the Epicurean? Nothingness. These Epicureans were similar to Nietzsche, but not at all identical. The Nihilists and the Epicureans had a significant difference. The Epicureans thought this life was all there is, so seek pleasure. Nietzsche thought this life was all there is, so despair. Probably both strands of thought can be found in American culture today. Only a minority, however, would affirm that there is no afterlife. For all the bluster of atheists, and the rush towards secularization that we see swirling around us, most Americans are reluctant to give up belief in the afterlife and in the eternal destinations of heaven and hell. In the survey, The State of Theology, Americans were asked if heaven and hell were real places. For the full survey results, see TheStateOfTheology.com. In this survey, two-thirds of Americans said yes to heaven. A little less, 61%, said yes to hell. But, here’s something interesting. 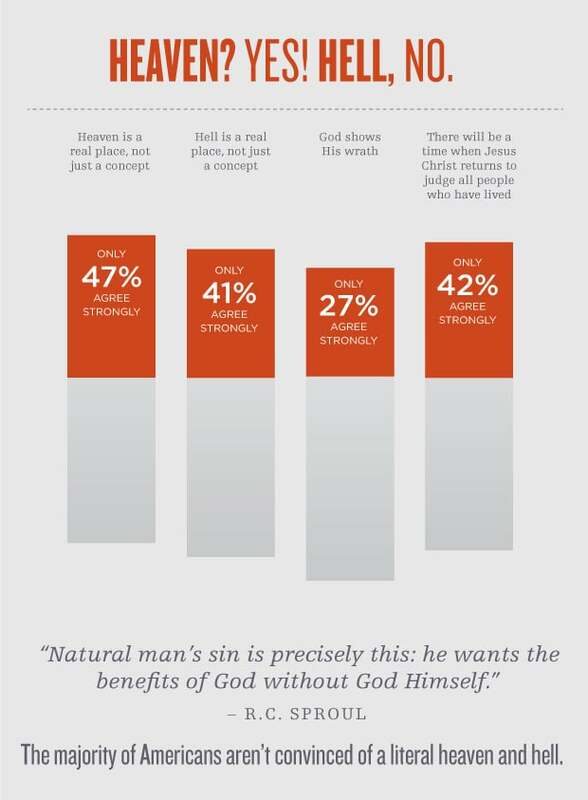 Only slightly over half of those polled think that God shows His wrath. Only 6 out of 10 believe that Christ will return to judge all people who have lived. The survey says there may be a hell but leaves you wondering who will be there? In this survey, two-thirds of Americans think most people are by nature good and almost half are reluctant to see God showing His wrath. What Francis Chan said about hell likely sums up the thinking of many contemporary Americans, “Hell, it seems, may be fitting for the Hitlers and Stalins of the world, but God–we assume–would never send mediocre sinners to hell.” It is a real place, but only the truly nasty will be there, goes the thinking. There are no mediocre sinners, just as there are no mediocre sins. The truth is all sinners deserve hell. This means one thing: no one deserves heaven. The early church father John Chrysostom once said, “Let us not avoid discourses concerning hell, that we may avoid hell. Let us not banish the remembrance of punishment, that we may escape punishment.” In other words, thinking does not make it so. Opinions about the afterlife, about heaven, and about hell do not have any bearing on the reality of these three things. Then there’s heaven. The Bible has plenty to say about heaven, but it seems that most Americans would rather lean on the experiences of those who had back-from-death moments, or near-death moments, to get informed about heaven. Believing heaven is real is one thing, knowing what the Bible says about heaven and having a proper understanding of it is quite another. These things are not cunningly devised fables, but the great dreadful realities of God’s Word, and things that, in a little while, you will know with everlasting certainty are true. How, then, can you rest in such as a state as you are in, and go about so carelessly from day to day, and so heedless and negligent of your precious, immortal souls? Heaven and hell are not only real, they are the only destinations of eternal and, therefore, ultimate significance.